AS SAVVY ARMCHAIR TRAVELERS, we LUPEC ladies know to look no further than our cocktail glasses to be whisked away to foreign lands. 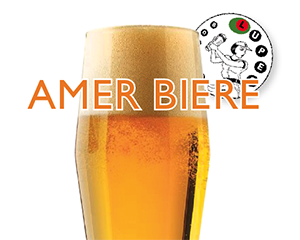 Fall may be on the horizon but the days are still long and warm, calling for refreshment of the Alsatian variety: a hefty glass of Amer Biere. Amer Biere is a take on the Shandy, aka a beer mixed with stuff (commonly lemonade if you’re in modern-day England). This delight starts with Amer, an Alsatian bitter liqueur to which lager is slowly added (a beer to Amer ratio of 8 to 1 is recommended). The slow addition of beer to the liqueur creates a frothy, aromatic head redolent of orange peel and spices. It’s a fine way to dress up your suds and one of the simplest ways we’ve discovered yet to produce a refreshing cocktail on the fly. The original recipe for Amer is credited to Gaetan Picon circa 1837 while stationed with the French foreign legion in Algiers. He mixed up his grandmother’s concoction for a special “tisane” or tea to cure his own malaria, and was soon tasked with creating it in larger quantities to cure his fellow troops. The recipe steeped gentian root, chincona bark, sugar syrup, spices, herbs, and caramel in alcohol for a healing potation. Picon’s recipe was eventually bottled and commercially sold and enjoyed great popularity all over the world. However, like many antique liqueurs, it has not stood the test of time. The product has been unavailable in the United States for decades and even if you could snag a bottle from a Frenchman, the recipe changed in the 197Os, the ABV has been lowered, and who’s to say if it tastes anything like Picon’s original? Wolfberger and Sommer produce some delicious Amers that are available stateside, thanks to Bliss Imports owner Kevin Button’s passionate desire to spread the gospel of the Amer Biere. “My goal was to have an Amer Biere wherever I went,” says Button. Wolfberger and Sommer have been producing fine wines, eaux-de-vie and Amer since 1885 and 19O2 respectively and are among the most highly regarded in their native Alsace. Wolfberger’s Wolfamer is an introduction to the classic flavors of a French Amer. Their Amer Gingembre is made with ginger and would be a hearty companion to a more robust lager, perfect for fall sipping in the pumpkin patch. Sommer’s Amer Fleur de Joie features aromatic hops, and their Fleur de Sommer integrate beer brandy and whiskey in a twist on the classic formula. 1½ ounces of Amer • top with blonde lager or wheat beer (8 to 1 ratio) • serve into a chilled glass. Cin-cin . . . or, should we say, Sante!